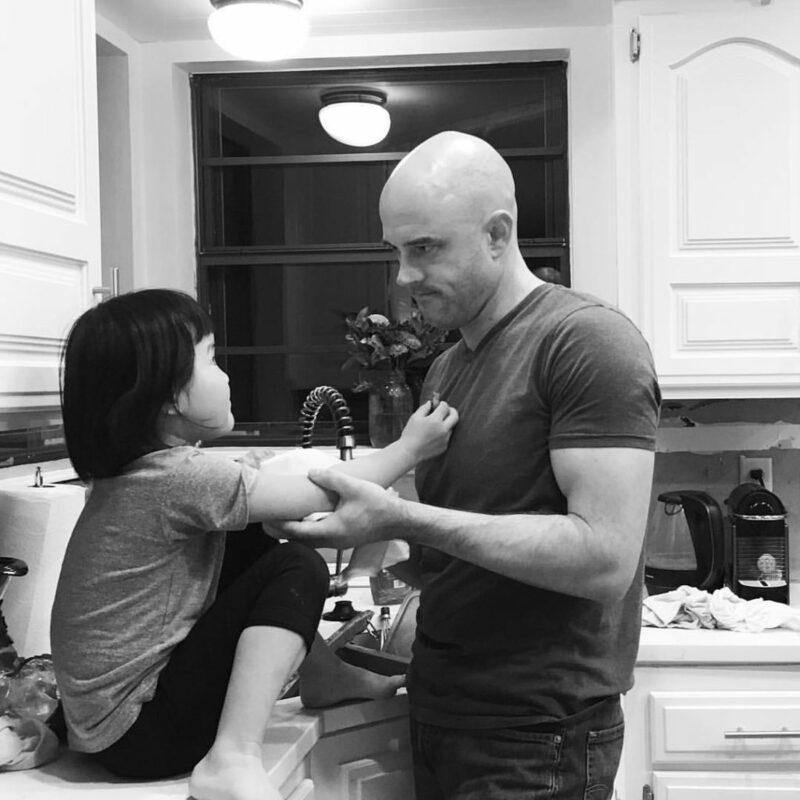 The week I found out that we had a zero percent chance of having a biological child, I had a dream where our Asian daughter sat on the kitchen counter. And here she is. There was lots of loss involved for each one of us, but thankful that we found each other and that our bond is what it is. I Hated Valentine’s Day. She Changed That. I’m not going to lie. I usually hate Valentine’s Day. Bryson and I have never celebrated it. 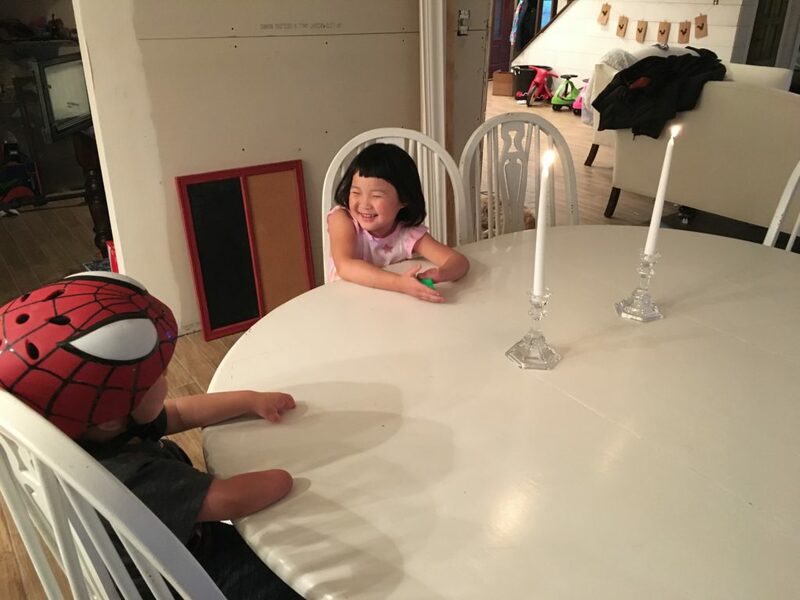 However, several days ago, I told him that I wanted to make the kids a candlelit dinner. I really wanted to demonstrate what loving pursuit and hospitality looks like. 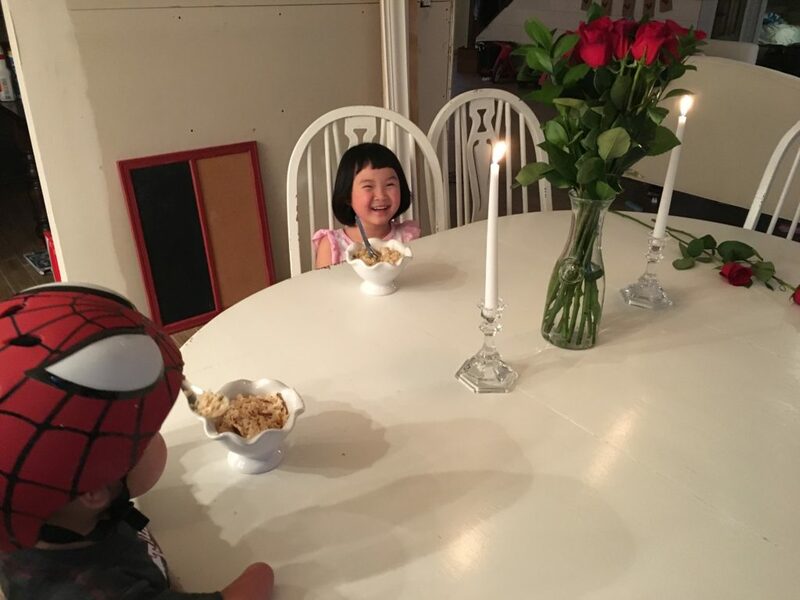 Lydia adores special meals and Valentine’s Day is her favorite because as she says, “it is all about love.” She is an old soul in a little body. But knowing my little girl’s true adoration of this holiday, I wanted her to relish in it, and feel our adoration. I wanted her to feel pursued. Her love for Valentine’s Day made me think about what love means to her. There was a time when I did not know if she could love us back, and I had to be content with that, and keep pursuing anyways. As I was making chocolate covered strawberries tonight, I thought long and hard about those tear-filled prayers. I begged that she would know love and be able to love in return. Not for me. Not because of me. Because of life. Life is about connection. I didn’t want more hard for her. “You love happy endings?” I expected to hear about her new favorite movie, Moana. And I stopped myself from explaining loss. I stopped myself from explaining that we are dysfunctional and that our story is no fairytale. I stopped myself from saying we did not rescue her, this time. I have said it before. I bit my lip this time and simply said, “I wish every kid could have a family too. You add joy to our family.” I do wish that. We are not a perfect family. I am far from a perfect mom. Bryson is not a perfect dad. 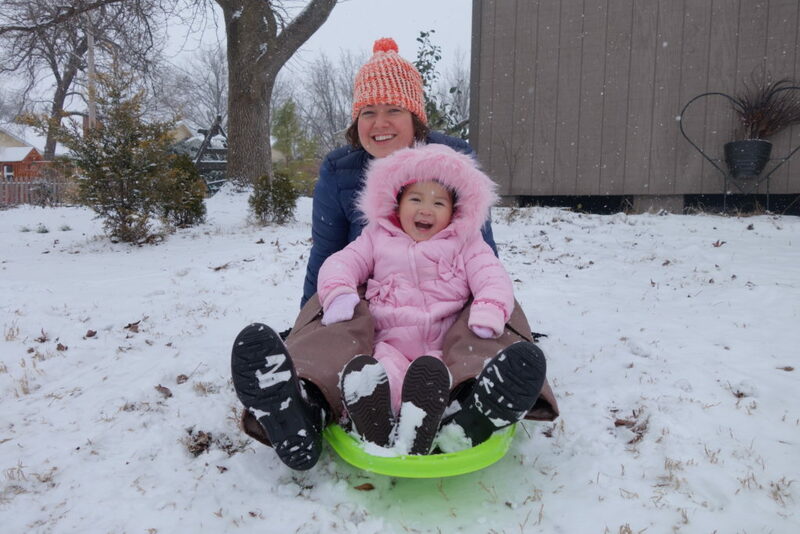 Sometimes, I am a connected parent, and sometimes a dysfunctional one. But this Valentine’s Day, we celebrate a type of love that is not based on DNA, feelings, consumption, religion, gifts, instant gratification, skin color, geographic boundaries, or reciprocation. We celebrate a kind of love that has taken time, patience, risk, courage, commitment, and sacrifice. We have learned so much from our little Valentine. I am thankful for the way she has helped me embrace a holiday that I once detested. I am thankful for the ways she taught me to pursue hearts, especially her heart and little Barrett’s. And I realized that tonight’s dinner did not demonstrate what loving pursuit and hospitality looks like, but we demonstrated it–with plenty of mistakes–the past three years. Oh my goodness Mandy, what love for these two little people. She closed her eyes while we set the table. She had no idea what we were doing. 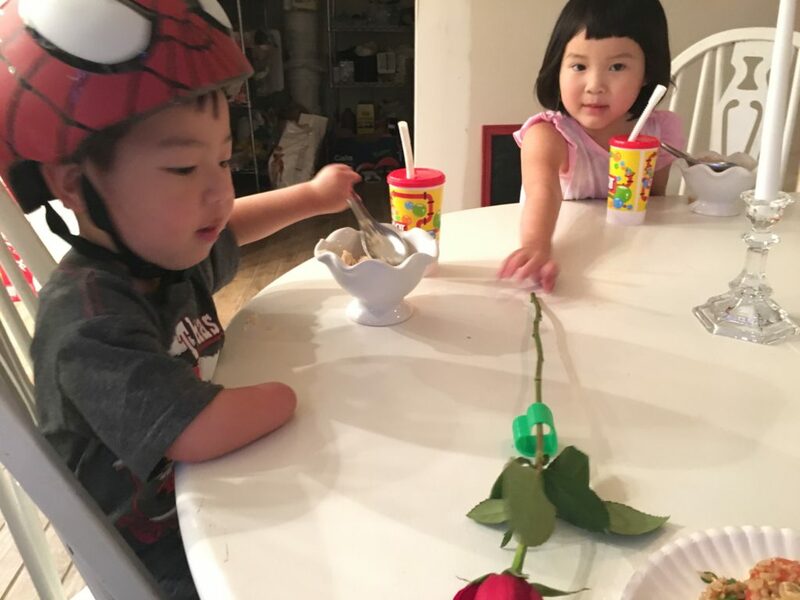 Bryson gave Lydia and Barrett roses. 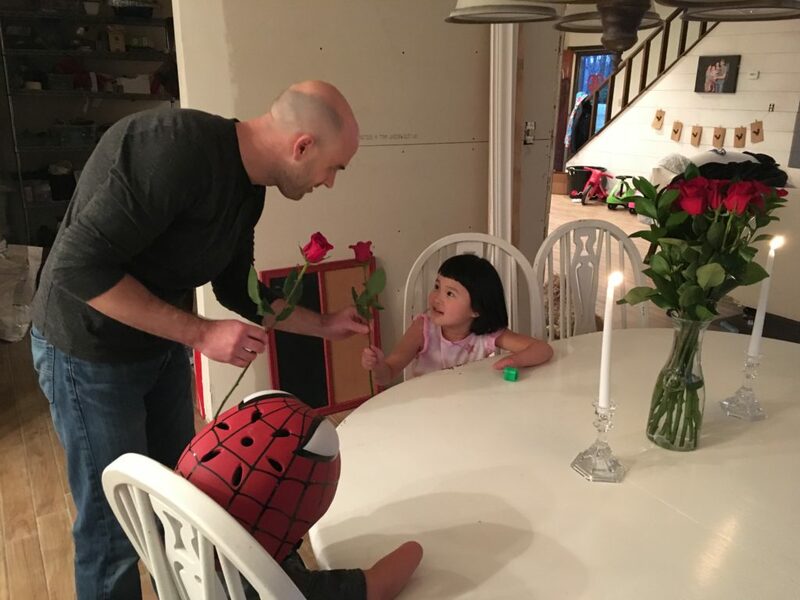 They both insisted that mommy receives the roses. Lydia gave me her rose and her new slinky toy. She was so happy. And Barrett was too. He declared, “I like baba. I like mama. I like Lydia.” And though physical affection weirds him out, little love kissed my hand. It has been awhile since I posted here. I want to be better about that. My October post for No Hands But Ours went live today. Would be honored if you took a look. Co-sleeping with this little dude has been a game changer. Slow progress, but progress in the right direction. He was terrified of our bed, and so we did not force it. He started in the pack-n-play, and as he got more comfortable with us, we tried our bed again. No way. Little Miss and Barrett FanFan were keeping the entire family up all night, and so we decided to split up. I would move to the office/guest room with Barrett FanFan and he would stay in the master with Lydia. Now neither child was particularly enthusiastic about this plan, but we knew we had to split up rooms. For the past 8 nights, FanFan and I have slept in the “guest room.” I have a twin bed, and he has a twin mattress of the floor. He has been slow to let me cuddle him or let me lay down on his bed. But I have seen incremental progress. Last night, I heard “Mama!” at 1 am and my little guy wanted to snuggle up next to me in my twin bed. He wanted me to cuddle him and comfort him that way. A first. He also belly laughed in his sleep. Who does that? A precious little guy. I am not usually one of those who compares myself to others, photos, or what I see on Pinterest or Facebook. I get it is not the complete picture and often people present the ideal self online. But, for whatever reason, the past 3 weeks I have felt guilty when I see the perfectly decorated home for Chinese New Year or a newly home family that is dominating at Christmas and life. Why can I not dominate at life? I wonder. Christmas here was very simple (as in you all will laugh at me when I post about it soon). Chinese New Year this year? Gosh y’all. We will just go out to eat. Maybe. Nah. Probably takeout. And today, I told myself it is okay if like FanFan, I can only take small steps during this season of change. Returning texts? Currently have 73 unanswered text messages. And the unanswered Facebook messages. Hundreds. The same grace I extend to him, I must extend to myself with all of the extra. Because right now, my capacity is focusing on the two little people entrusted to my care and learning who the newest little is. That’s it. And that is perfectly wonderful and simple and complicated and messy and enough for one mama. So for now, those 73 text messages will go unanswered. The Christmas tree will stay up. The pumpkins on my front porch leftover from Halloween will remain there. And my life won’t look Facebook perfect. Because tonight when a little boy said, “Mama! Come here!” and hit his lucky fin to the pillow to say “this spot is just for you, mama” I could tell he was opening his heart to me for a second, wanted me to be near, and to learn a little more about his new mama too. That is a miracle, but none of today was perfect. I am not putting pressure on FanFan to be anything other than who he is and I am doing my best to give him extra grace during this adjustment, and I need to do the same for me. Brown Bear, Brown Bear, what do you see? I see a mama doing her okayest looking at me. And okayest is really good enough. Saying goodbye to pressure is a gift. Seriously. 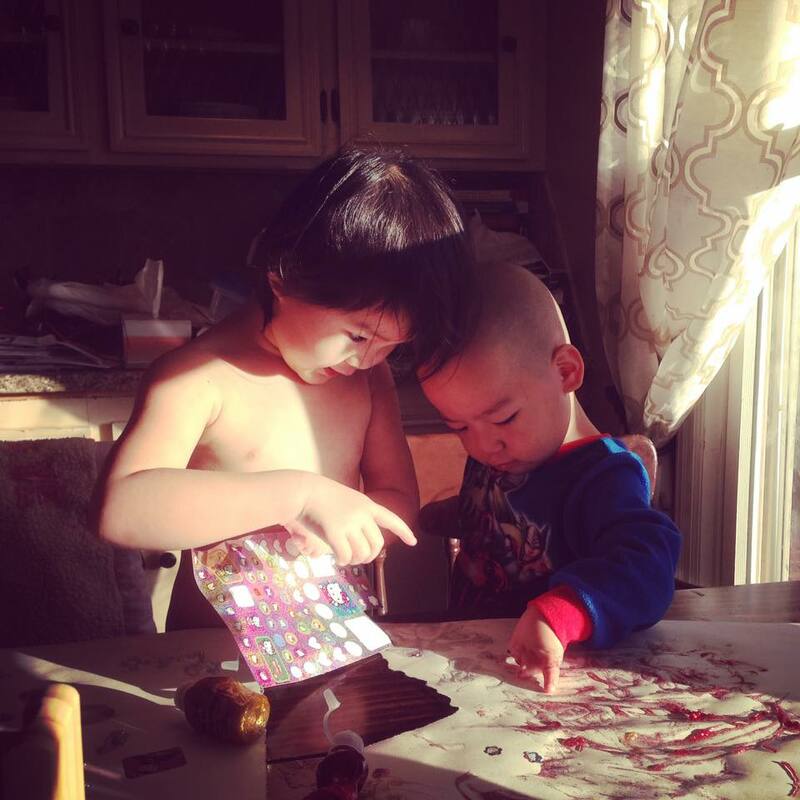 What a hard thing to instantly have a toddler brother you don’t know to share with, instantly. We’ve all had moments where we’ve made ugly mistakes in the process of learning to love each other and embrace each person. But this girl is so kind to her brother. She’s providing lots of help at craft time. And seeing the two of them together – wow – I’ve had a front row seat at her transformation over the past two years and despite the messy moments, it is truly remarkable. Bonding and attachment takes time, for all involved. 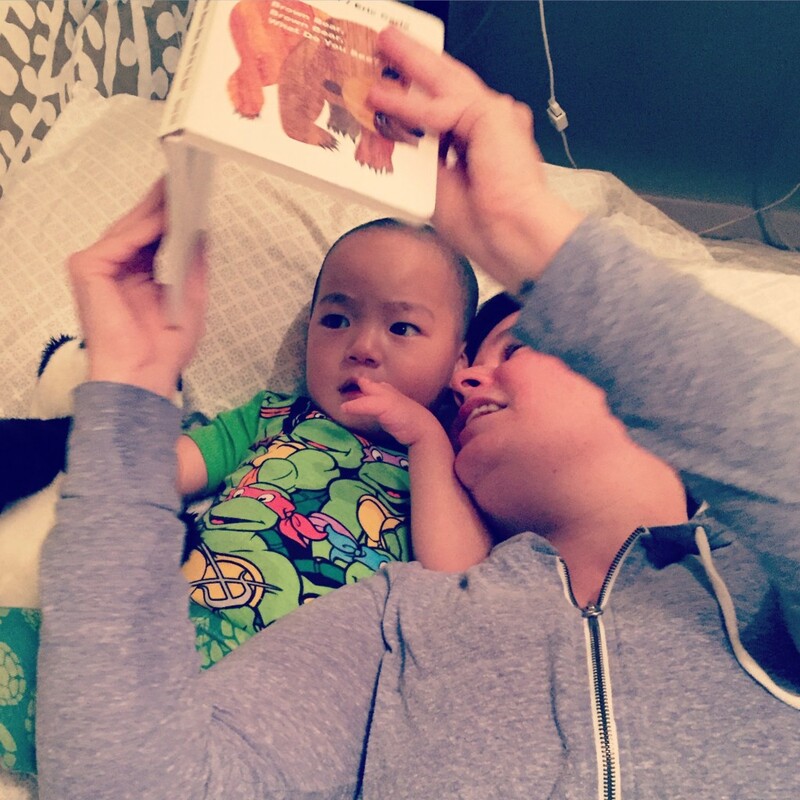 And even though Barrett FanFan calls me mama by name–and has since day one–I can tell he doesn’t feel I am mama just yet. That takes time. But I know that’ll come. In our instant gratification culture, it is hard to wait. We want, what we want, instantly. Often, we want it without hard work or sacrifice. We don’t want to invest. That’s just not how much of life works. Even with cocooning, we realized some people were not supportive of our cocooning efforts with Lydia because it is so counter our culture. It is counter instant gratification. Wait. Just wait. See what slowing down and pushing the pause button on rushing here and there does. Watch what happens when we choose to slow down life and focus on one thing: connection for the four of us. Barrett FanFan doesn’t feel comfortable with my kisses–so wait. Oh, how I would love a slobbery toddler kiss, but I will wait. Give it time. He doesn’t feel I am mama just yet. But that is starting to change in slow increments. Saying no to the busy and hectic, saying no to the dishes and cleaning gives me permission to watch the most beautiful work unfold. Yesterday, he asked me to get off my twin bed in the guest room and join him on his twin bed next to mine. 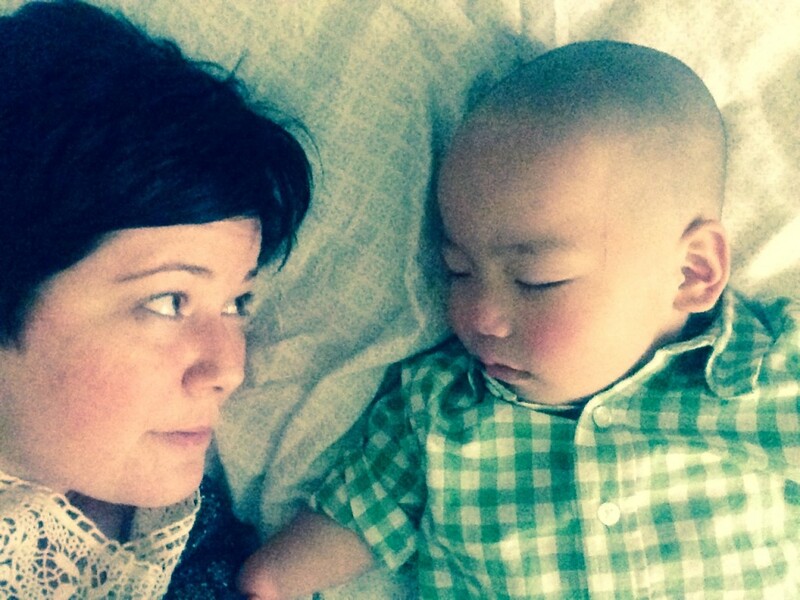 “Mama,” he said and grunted like a little dinosaur, smacking his hand down next to him. He was saying mama, I want you here. So there I went, only getting as close as his body language told me he was comfortable with. What a huge gesture. What a big step for both of us as we step into mama and son. 26 days. It took 26 days.